Mopeds are a great way to get from A to B when you simply don’t have the money to lay down on a car. However, with all of the makes, models and features choosing your first moped can be a daunting task! This guide aims to make sense of it all so you can find the right scooter for you. 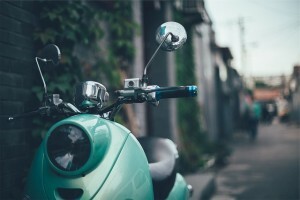 Here are just some of the things you should consider when looking for a potential moped. Engine capacity, measured in cubic centimetres (cc), can affect several aspects of a moped. Firstly, the mileage you get out of a tank on a gas scooter with higher cc will be lower. Secondly, the speed you are able to achieve while in top gear is likely to be higher. For beginners we recommend an engine capacity of around 50cc. While none of us are trying to break the sound barrier (hopefully! ), a moped should feel quick and responsive without breaking the legal speed limit of 45 kp/h. Be aware, however, that in different countries the laws are slightly different. For example, the maximum legal speed limit for mopeds in Japan is 30 kp/h. This means that mopeds purchased from overseas could be unsuitable for your country. The torque and horsepower affects the acceleration, with higher numbers meaning a higher acceleration (assuming the weight of the vehicle is equal). In the States brake horsepower should not exceed 2, but again this can vary depending on your location. Always check the laws of your state or country before making a purchase to avoid ending up with something which isn’t street legal. It’s a good idea to check out the reputation of a manufacturer before purchasing any of their scooters. Yamaha, Honda, Suzuki and BMW are just some of the most reputable brands, with Yamaha producing good budget models. You should always be sensible about the amount of money you spend on a scooter. If you can’t afford the top end models, try something a little cheaper which doesn’t break the bank. You do get what you pay for though, and being too stingy could mean the difference between a moped which serves you well for years and something which falls apart after a few months. If you want more help and advice, be sure to check out our reviews. We have written a number of in-depth gas scooters reviews, and anything we have rated highly is likely to perform well.